Enjoy quick, easy and saucy One-Pan Orange-Mango Chicken. This orange-mango chicken is a Healthy Living recipe with minimal cleanup but superior flavor. Heat oil in large skillet on medium-high heat. Add chicken; cook 3-1/2 to 4 min. on each side or until done. Transfer chicken to plate; cover to keep warm. Add onions and orange juice to skillet; bring to boil. Simmer on medium heat 2 min., stirring occasionally to scrape browned bits from bottom of skillet. Whisk cornstarch, sugar and dressing until blended. Add to skillet; cook and stir 30 sec. or until thickened. Add chicken (with juices) and orange slices; cook 1 min. or until chicken is heated through. 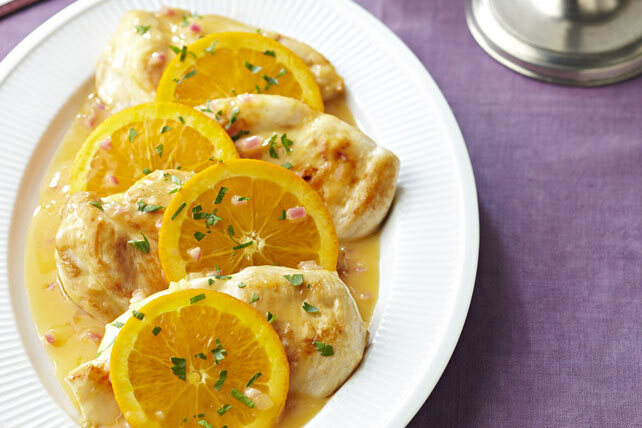 Place chicken on platter; top with orange slices and sauce. Sprinkle with parsley. Serve with hot cooked long-grain brown rice and seasonal mixed fresh vegetables.